Come for a pint, stay for the craic. - De website van kellysantwerp! You could be in Ireland! With their typical flair the mainly Irish waiters take a pleasure in guiding you through the extensive list of Irish beers, the impressive choice of whiskies and the traditional Irish menu options. Whether you choose Irish Stew, bangers & mash, cottage pie or a succulent hamburger, the ingredients are always of top quality! This place is mainly a sports bar where sports fanatics can follow live games on no less than 12 plasma screens. You can also enjoy the upbeat atmotsphere during the weekends with live music and Djs! 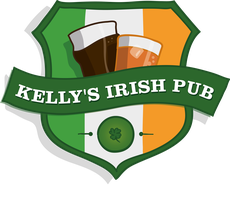 Kelly's Irish Pub is a member of the group Antwerp Boulevard bvba.